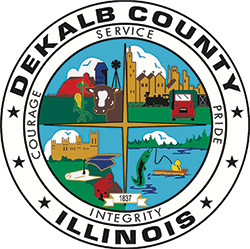 Bond can be posted 24 hours a day, 7 days a week at the DeKalb County Jail. There is a $30 processing fee collected in addition to the bond. This fee is not collected with the credit card. If paying bond by a bank check do not include the $30 fee in the amount of the check, it must be separate. All Failure to Appear warrants have a $75 fee that is in addition to the bond. Please inquire with a deputy if this is applicable to the bond you are posting. If an inmate cannot make bond or has a charge that does not have a bond set, the first appearance will be bond call. Bond call is done by Closed-circuit television. You may attend Court by going to the DeKalb County Courthouse (133 W. State St., Sycamore) Room 220. Bond call is Monday-Friday at 1:00pm. and Saturday at 8:30 a.m. After bond call you may come to the jail to post bond. If bond is not posted, the inmate remains in jail until released by court order or bond is posted. Subsequent appearances for court are also done on video unless otherwise ordered by the court. Bench and Jury trials are held at the courthouse.